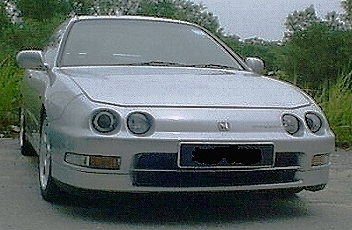 The JDM Honda Integra changed generation in early 1993. The new model, coded DB for 4-door and DC for 3-door received a body revision and quad-projector headlights. The most significant change however was the engine upgrade, from the 1.6l B16A to a longer stroke 1.8l DOHC VTEC B18C with a new intake manifold. The B18C engine red-lines at 8000rpm and generates 180ps at 7600rpm. Although only 10ps higher than the current B16A, its bigger displacement and the special intake manifold gave much better low-end and mid-range making it more driveable over the B16A especially with curb weight being only moderately increased. The new B18C intake manifold uses two sets of intake runners. The cut-away diagram of this intake manifold on the right shows how the runners are arranged. A marks the plenum (which the throttle body attaches to). B is where the intake runners attaches to the cylinder head. C is used to give readers a sense of perspective, it marks the fuel injectors. The top set of runners are curved around the lower set making it longer. The lower set of runners have butterfly valves built into them (marked by D). During low and mid-rpm operations, the valves are closed and only the top set of runners are feeding air into the cylinders. After 5800rpm, the butterfly valves open and air will now be fed into the cylinders via both sets of intake runners. This new intake system works in conjunction with VTEC, which now switches at 4400rpm, to optimize air-flow into the cylinders at all RPMs making the power/torque curve of the B18C extremely wide and flat. Peak torque of the B18C is 17.8kgm at 6200rpm but torque output of the B18C is already near or at 17.0kgm all the way from approx 2500rpm right until the 8000rpm, a smaller than 5% spread for practically all operating RPMs !! The DC2 Integra in this article is a JDM used-import. Manufactured in 1993, it is around 6 years old when the owner decided to upgrade its overall performance last year in 1999. The approach he took was the interesting question of using only drop-in/straight-fit mods. Drop-in/straight-fit mods are designed to give instant power increase with minimal work needed. Often it takes no more than an hour or so visit to the proper speed shop for dismantling and fitting. Straight-fit mods are designed so that they utilize the original mounting points and will not require any sawing or hacking for fitting. Technically drop-in mods exploits the head-room and compromises built into a stock engine. Head-room is typically safety factor intentionally built-in, eg running the engine slightly rich to compensate for varying atmospheric conditions. Compromises are usually built-in for legal requirements or for domestic desirability : emissions, noise, fuel consumption, driveability, and sometimes even manufacturing cost. Drop-in mods - if properly designed - can exploit these two factors, eg by fine-tuning the air-fuel ratio, for instant power-gains without too much engine work. The down-side is that for well-designed engines - and Honda's DOHC VTEC engines are prime examples - the head-room is smaller and the compromises are more performance oriented, so power gains will almost always be only moderate. Also exploiting the compromises means some sacrifices for the driver, eg much louder exhaust, or in some cases the ethical issue of increasing emissions. Prior to his product purchases, the owner did extensive research in the Internet as well as consulted with friends & speed shops. For the engine, he decided on the complete filter-cat/back-header-a/f regulator combination. He also wanted to properly tune the a/f regulator device so a dyno session was deemed necessary. This combination was an almost complete straight bolt-on except for one minor detail which we will cover later. Careful planning was done so that the main hardware; headers and cat-back were installed first. These were bought from one shop. The remainder items, the air-filter, a/f regulator and dyno-tuning were from another shop which also supplied all the rest of his upgrades. The first item that went in were Tanabe headers. This is a stainless steel design optimized for power delivery. The headers were for the B18C Spec-R since Tanabe doesn't make headers for the regular B18C. The Tanabe G-Medallion cat-back exhaust system was installed the following day. However the B18C Spec-R uses a shorter cat so the headers extended longer. When used with the longer cat of the B18C, the cat-back exhaust was pushed further back causing some of the mounting brackets to hit the under-carriage. This was resolved by replacing the cat with a custom made straight-through pipe. Though the owner was concerned about the increased emissions, the was unfortunately his only immediate solution. During the weekend, the final parts were installed. This comprises the installation of a HKS Super-Power-Flow system, ie the Super-Power-Flow air-filter plus a custom designed HKS extension pipe and mounting brackets. This kit places the filter in the optimum position. Then the HKS AFR a/f regulator was installed. The AFR will allow the air-fuel ratio to be optimized for maximum power delivery. However the only proper method to set it is still through a dyno tuning session. Fortunately the AFR came packaged with dyno-tuning included so this nicely allowed the whole mods package to be optimized for maximum power delivery.